This is a members-only video. 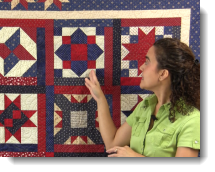 To learn more about becoming an Overall Quilter Member, click here for more details. If you’re already a member, you can login to view the full video. Block 5 is a review on a four patch and a flying geese unit. Remember to drop your stitch to a 2.0 for a flatter seam and when pressing, always set the seam first and then with a swooping motion press towards the dark. Refer to blocks 1 and 3, the only difference is you have different color placements. Borders: You have six 6 1/2″ blocks to make. Instructions are written for just one block, make sure you cut enough for 6. This smaller block has a rectangle unit with triangles on each side. Pay attention to the placement of each color. It also has half square triangle units. By now you should be getting better at making these half square units. Program will be included in your membership. Each month you’ll be able to download the block instructions. Each block will have a video to follow along with the instructions. Blocks will stay on the member’s site so you can start anytime you wish. The program is $3 per block. Purchase your block each month via the online shop. Blocks will be added monthly to the online shop.